My 9 year old daughter Nadia Albertelli is wearing this costume. It was Nadia's idea to become an unconventional witch. She loves fashion and is always drawing fashion illustrations. She was blown away and really inspired after seeing the incredible fashions of Iris van Herpen exhibit this summer at the Dallas museum of Art. We worked together and came up with a black raven feather dress idea. I'm not a fashion designer by trade all, so this was a learning experience; but Nadia's passion inspired me. Nadia insisted that she did not want to have a regular pointy witch hat, and asked me to come up with a head piece on a headband. The dress was constructed with petticoat wire rings, black mesh and thin acrylic. black feather ribbon was sewn into the dress. 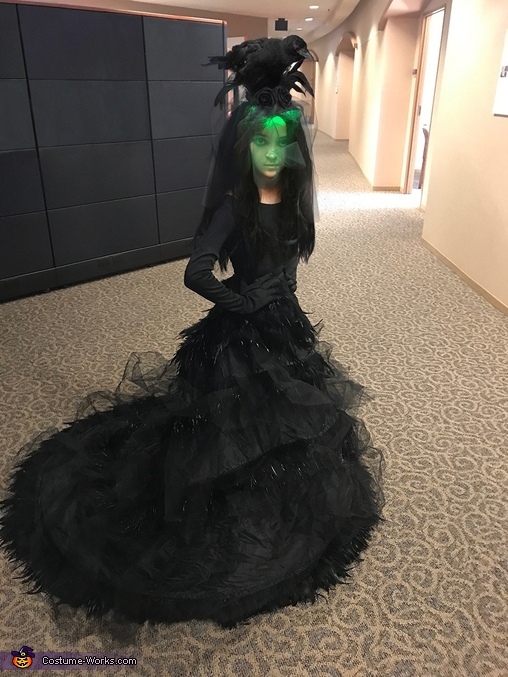 The head piece has 4 sets of green LED string lights, coiled up and sewn into a small rim to illuminate her face completely green. We got a faux black crow, and adorned black flowers, mesh and stiff black fabric backing to keep it all upright. It was bobby pinned to a black wig which was bobby pinned to Nadia's hair. The response we got was incredible. It was praised by friends and family for all the details and craftsmanship, and lots of wows at her glowing face during trick-or-treating. Coming up with a costume together is a bonding event for me and Nadia. We love it and she's my little muse. Thanks for time and your consideration. Kind Regards, Saba and Nadia.